The Virginia-class submarine program is finalizing the Virginia Payload Module design and will start prototyping soon to reduce risk and cost as much as possible ahead of the 2019 construction start, according to a Navy report to Congress. 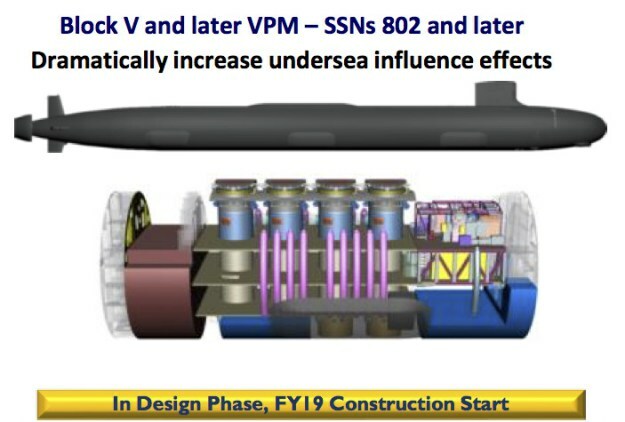 According to the “Virginia Class Submarine Cost Containment Strategy for Block V Virginia Payload Module Design” report, dated Aug. 31 but not received by the Senate until mid-October, the Navy says late Fiscal Year 2015 and early FY 2016 is a “critical” time period for the program. “Since the previous report (in early 2015), the Design Agent (General Dynamics Electric Boat (GDEB)) finalized the concept design, reviewed and started updating the Integrated Master Schedule (IMS), issued a prototype plan, commenced arrangement activities, and submitted all ship specification requirements and Key Decisions for approval,” the report states. The Navy selected a design concept in November 2013 and has, with Electric Boat, been refining that design ever since. This early risk-reduction work proved important in the Virginia-class submarine program, which has minimized requirements and cost creep throughout the 20-year history of the program, and officials are trying to replicate that success in the VPM project, according to the report. “There have been no changes to the CDD (capability development document) since it was initially approved in December 2013. The CDD sets clear KPPs (key performance parameters) for cost, strike capability, and schedule based on stable requirements,” reads the report. The design has not been finalized yet, but GDEB has submitted its recommendations for all 39 “key decisions,” and the Navy has approved 16 of them. The service has also tested out the design in a lab setting to ensure it will work well with the Virginia subs and their own set of requirements. The Navy held a VPM Strike Concept of Operations Exercise (COOPEX) in June 2015 at Naval Undersea Warfare Center (NUWC) Newport to provide feedback early in the systems engineering process “to understand if conceptual configurations efficiently meet future VPM mission requirements. The Naval Sea Systems Command’s (NAVSEA) engineering directorate will update cost estimates soon based on the final concept design, but so far the program has been successful in sticking to its cost goals. The program had a threshold requirement of $994 million and an objective requirement of $931 million in non-recurring engineering costs, and as of January 2015 the program estimated it would end up spending $936 million. The first VPM module is required to cost $633 million with an objective cost of $567 million, and the most recent estimate puts the lead ship VPM at $563 million. Follow-on VPMs would be required to cost $567 million each with an objective cost of $527 million, and the January estimate puts them at an even lower $508 million.